A question (to which I don’t have the full answer): why are the interest rates on Italian and Japanese debt so different? As of right now, 10-year Japanese bonds are yielding 1.09%; 10-year Italian bonds 5.76%. I ask this because in a number of ways the two countries look similar. Both have high debt levels, although Japan’s is higher. Both have awful demography. In other respects, the numbers if anything favor Italy, which has a much smaller current deficit as a percentage of GDP. So, the spread is quite persistent. 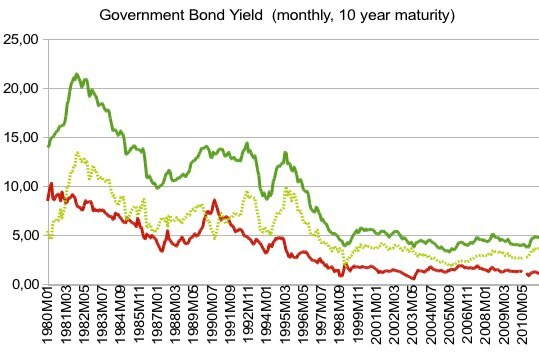 For decades Italian government bonds delivered a higher yield than Japanese ones. What does theory say about this? So, investing $1,000 in Italian government bonds in 1980 will give you about L800,000. This will increase about 10-fold in 20 years at an average yield of 12.4%, returning you L8,000,000 in 2000. Since a dollar is now worth L2.250 this translates into $3,555. Now for Japanese bonds. Y250 to the dollar would have given you Y250,000. With a yield of 5.2% the return will be about 2.75, which gives you about Y687,500, which in 2,000 at an exchange rate of Y105 to the dollar would have been $6,547. In seems that the Japanese government debt would have been the better investment in hindsight (assuming that there is no risk of default, of course). Now in 2,000 the euro was already introduced, since a year before the exchange rates were fixed. Now people expected the euro to appreciate over the long-run against the dollar, and Italian yields came down towards German levels. Japan, having been in a slump since 1990, had low yields since inflation was no problem and the Yen expected to gain further. The recent experience of higher Italian yields is a euro zone problem, I’d say. While Japan can print its way out of its government debt if it needs to, Italy cannot. Also, Japan is very competitive in world markets and therefore the risk of a prolonged slump (in order to regain competitiveness) is unlikely, especially since the Bank of Japan oversees the exchange rate and does intervene from time to time. In Italy, control over the instrument of monetary policy has been lost, and there is no exchange rate to manipulate either. Decreasing prices would kick-start exports, but at the same time increase the burden of real debt for the borrowers, which would harm domestic consumption. Doubts might arise whether Italy can repay at all. To sum up, I would argue that higher yields of Italian debt from 1980 to 2000 was mostly driven by expectations of exchange rate changes, and that now with the euro these still determine the spread between the government bond yields of Japan and Italy. 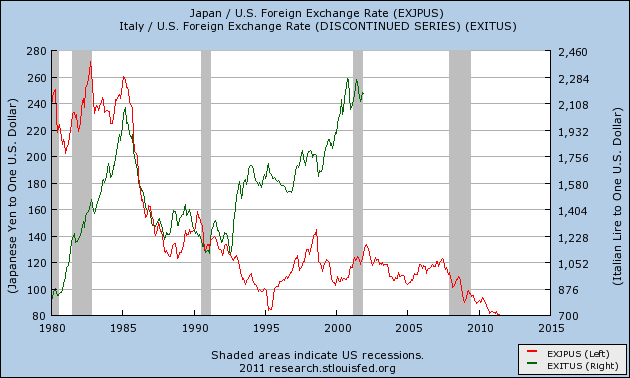 Yes, Italy might look better from the debt mechanics, with debt/GDP not as high as in Japan (but more insecurity on where growth should be coming from), but Japan looks better from the international perspective, being a net exporter with a currency that historically has gained against the dollar. « The Euro – Sickness unto Death?